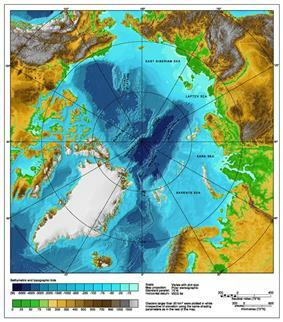 A bathymetric/topographic of the Arctic Ocean and the surrounding lands. The Arctic Ocean, located in the oceanographers call it the Arctic Mediterranean Sea or simply the Arctic Sea, classifying it a mediterranean sea or an estuary of the Atlantic Ocean. Alternatively, the Arctic Ocean can be seen as the northernmost part of the all-encompassing World Ocean. For much of European history, the north polar regions remained largely unexplored and their geography conjectural. Pytheas of Massilia recorded an account of a journey northward in 325 BC, to a land he called "Eschate Thule," where the Sun only set for three hours each day and the water was replaced by a congealed substance "on which one can neither walk nor sail." He was probably describing loose sea ice known today as "growlers" or "bergy bits;" his "Thule" was probably Norway, though the Faroe Islands or Shetland have also been suggested. The few expeditions to penetrate much beyond the Arctic Circle in this era added only small islands, such as Novaya Zemlya (11th century) and Spitsbergen (1596), though since these were often surrounded by pack-ice, their northern limits were not so clear. The makers of navigational charts, more conservative than some of the more fanciful cartographers, tended to leave the region blank, with only fragments of known coastline sketched in. In World War II the European region of the Arctic Ocean was heavily contested : the Allied commitment to resupply the Soviet Union via its northern ports was opposed by German naval and air forces. The Arctic region; of note, the region's southerly border on this map is depicted by a red isotherm, whereby all territory to the north averages temperatures of less than 10 °C (50 °F) in July. The Arctic Ocean occupies a roughly circular basin and covers an area of about 14,056,000 km2 (5,427,000 sq mi), almost the size of Russia. The coastline is 45,390 km (28,200 mi) long. 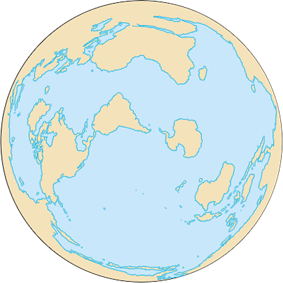 It is surrounded by the land masses of Eurasia, North America, Greenland, and by several islands. In Alaska, the main ports are Barrow () and Prudhoe Bay (). In Canada, ships may anchor at Churchill (Port of Churchill) () in Manitoba, Nanisivik (Nanisivik Naval Facility) () in Nunavut, Tuktoyaktuk () or Inuvik () in the Northwest territories. In Greenland, the main port is at Nuuk (Nuuk Port and Harbour) (). In Norway, Kirkenes () and Vardø () are ports on the mainland. Also, there is Longyearbyen () on the island of Svalbard next to Fram Strait. Due to its relative isolation from other oceans, the Arctic Ocean has a uniquely complex system of water flow. It is classified as a mediterranean sea, which as “a part of the world ocean which has only limited communication with the major ocean basins (these being the Pacific, Atlantic, and Indian Oceans) and where the circulation is dominated by thermohaline forcing”. The Arctic Ocean has a total volume of 18.07×106 km3, equal to about 1.3% of the World Ocean. Mean surface circulation is predominately cyclonic on the Eurasian side and anticyclonic in the Canadian Basin. Much of the Arctic Ocean is covered by sea ice which varies in extent and thickness seasonally. The mean extent of the ice is decreasing since 1980 from the average winter value of 15,600,000 km2 (6,023,200 sq mi) at a rate of 3% per decade. The seasonal variations are about 7,000,000 km2 (2,702,700 sq mi) with the maximum in April and minimum in September. The sea ice is affected by wind and ocean currents which can move and rotate very large areas of ice. Zones of compression also arise, where the ice piles up to form pack ice. The temperature of the surface of the Arctic Ocean is fairly constant, near the freezing point of seawater. Because the Arctic Ocean consists of saltwater the temperature must reach −1.8 °C (28.8 °F) before freezing occurs. ^ a b c Michael Pidwirny (2006). "Introduction to the Oceans". www.physicalgeography.net. Archived from the original on 9 December 2006. Retrieved 2006-12-07. ^ Tomczak, Matthias; Godfrey, J. Stuart (2003). Regional Oceanography: an Introduction (2 ed.). Delhi: Daya Publishing House. ^ Arctic Ocean' - Encyclopædia Britannica"'". Retrieved 2012-07-02. As an approximation, the Arctic Ocean may be regarded as an estuary of the Atlantic Ocean. ^ Since the beginning of the 21st century, sea ice covers only 1/3 to 1/2 the surface of the Arctic Ocean at the end of summer. ^ Pytheas Andre Engels. Retrieved 16 December 2006. ^ a b Wright, John W. (ed. ); Editors and reporters of The New York Times (2006). The New York Times Almanac (2007 ed.). New York, New York: Penguin Books. p. 455. ^ "Oceans of the World". rst2.edu. Retrieved 2010-10-28. ^ "Arctic Ocean Fast Facts". wwf.pandora.org (World Wildlife Foundation). Archived from the original on 29 October 2010. Retrieved 2010-10-28. ^ a b c d CIA World Fact Book: Arctic Ocean. Retrieved 11 November 2013. ^ "The Mariana Trench – Oceanography". www.marianatrench.com. 2003-04-04. Archived from the original on 7 December 2006. Retrieved 2006-12-02. ^ a b Polar Discovery: Arctic Ocean Circulation. Retrieved 2 November 2013. 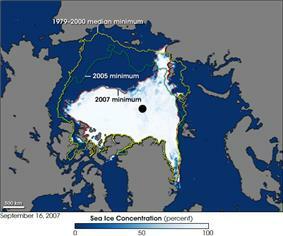 ^ Continued Sea Ice Decline in 2005 Robert Simmon, Earth Observatory, and Walt Meier, NSIDC. Retrieved 7 December 2006. ^ Sea Ice Index. Nsidc.org. Retrieved on 2011-03-06. ^ Polar Sea Ice Cap and Snow – Cryosphere Today. Arctic.atmos.uiuc.edu (2007-09-23). Retrieved on 2011-03-06. ^ "NSIDC sea ice". Archived from the original on 17 January 2010. Retrieved 2010-02-10. 2 levels in the Early-Middle Paleogene". Palaeogeography, Palaeoclimatology, Palaeoecology 193 (1): 113–123. ^ Sluijs, A.; Schouten, S.; Pagani, M.; Woltering, M.; Brinkhuis, H.; Damsté, J.S.S. ; Dickens, G.R. ; Huber, M.; Reichart, G.J. ; Stein, R.; Others, (2006). "Subtropical Arctic Ocean temperatures during the Palaeocene/Eocene thermal maximum". Nature 441 (7093): 610–613. ^ a b Physical Nutrients and Primary Productivity Professor Terry Whiteledge. National Oceanic and Atmospheric Administration. Retrieved 7 December 2006. ^ Russia the next climate recalcitrant Peter Wilson, 17 November 2008, The Australian. Retrieved 2 February 2009. ^ Lauren Morello (March 5, 2013). "Warmer Arctic with Less Ice Increases Storm Surge". Climate Central. Retrieved March 8, 2013. 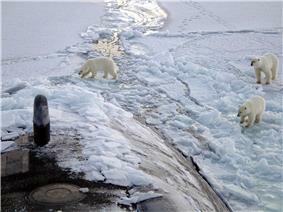 ^ 400 million cubic meters of radioactive waste threaten the Arctic area Thomas Nilsen, Bellona, 24 August 2001. Retrieved 7 December 2006. ^ Tim Phillips, "Alaska Natives Sue Federal Government for Approving Shell's Insufficient Clean-Up Plan for a Potential Oil Spill in the Arctic Ocean", Activist Defense, July 11, 2012.